Mysore being a cultural hub needs no introduction on why there are thousands of tourists flocking towards this marvellous place each year. The center of attraction being the majestic Mysore palace. Its beauty is bound to hypnotize you and make you weak on the knees. At some point in our lives, each one of us has wondered what it would be to live life king size. The Mysore palace definitely is a peek into the kingsize life. Kudos to the Government of Karnataka for preserving the astonishing beauty of this marvellous piece of architecture built over a century earlier in splendid condition. The second place that comes to a person’s head when you hear ‘Mysore’ after Mysore palace is the Mysore zoo. 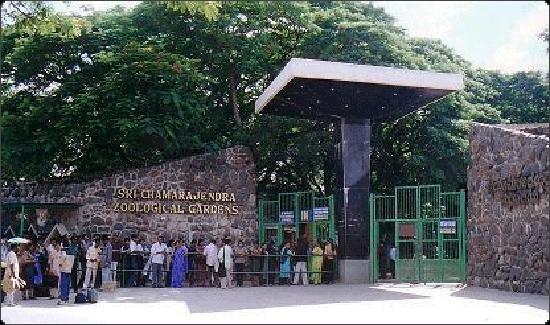 Don’t worry the infamous Mysore zoo and the Chamarajendra zoological gardens are one and the same. The location of the Mysore zoo is perfect for tourists visiting the Mysore palace as it is just a mere 1.5kms from the palace. Since you have made it all the way to the city of palaces, a trip to the Mysore zoo is the perfect topping to enjoy the nature’s wonders. Gazing at a wide variety of beautiful animals and birds like elephants, zebras, giraffes, rhinoceros, tigers, baboons, cobras, crocodiles, anacondas, peacocks, swan etc are the perfect visual treat for families, children or even the little child within you. Located at a 1.4kms from the Mysore palace, this mesmerising lake is also at a walkable distance from the palace. Taking a peaceful stroll along this serene lake is the perfect antidote from the city life. Tourists also have the option to go on boat rides along this lake.A small entry fee of Rs.10/- is also applicable for adults and Rs5/- for children.Carrying a camera will also be charged at Rs.10/- for still and 25/- for video cameras. Located right beside the Mysore palace at a kilometer’s distance, this palace is in fact historically older than the current Mysore palace. This was used by the kings when the current Mysore palace was under construction after a fire incident. Currently, it operates as an art gallery with rare and exclusive paintings from the king’s collection. The king had a vast collection of materials brought from different parts of the world to make his palace truly world class. Marble floors from Italy, painted glass from Belgium, chandeliers from Slovenia, based from Venice include just some of his spectacular collections. If you’ve ever tried to build a sand castle at a beach you might understand the difficulty level of creating art on the sand. This museum that is bound to leave you awestruck is again at a short travel distance of 4km from the Mysore palace. Within a short travel time of around 10 minutes, you will be able to reach this museum from the palace. The museum is home to some beautiful, intricate pieces of art carved on the sand. Although it won’t take you long to cover the entire museum, it should definitely be on your list.Especially if you have not witnessed any sand sculptures in the past. Considered to be Asia’s 2nd largest church in architecture, the St.Philomena’s cathedral is truly wonderful and is bound to bring serenity in one’s mind. The church is built in Roman style architecture back in the 20th century with the glass paintings, colours used and statues depicting their Neo-Gothic style. Famous Bollywood movies like Amitabh Bachchan starrer “Amar Akbar Anthony” have also been shot at this church. This historic marvel is also located at a 10-minute drive from the Mysore palace which makes it a must visit. With most Indians come their love for trains.Trains have been a part our best experiences for many of us. The history of the locomotives is well displayed at this museum, located around 3 km from the Mysore palace. They also give an insight into the flamboyant travel style of the Mysore royalty. A collection of the royal carriages and a sight of two royal coaches is also accompanied by the first steam engine built in India in this museum. While you’re there, you must not miss out on how the daily life of many locals revolves around this market. With fruits, flowers, vegetables and almost all daily needs, Devaraja market is a sight by itself. Tiny rows packed with stalls of different kinds do magnetize tourists looking for the local colorful “supermarket”. This 100-year-old market blends with Mysore’s age-old heritage and still is every local’s go-to place with over 700 traders present. Located at 1.5kms from the Mysore palace, this is also one of the easily accessible popular destinations. If you are lucky enough to visit Mysore during the Navratri, the Dussehra fair usually lasts for a few months after the festival. Located right at the Jayamarthanda gate of Mysore Palace, the Dussehra festival is celebrated in an extravagant way in this city. This ten-day festival attracts many tourists from around the globe to Mysuru to experience the city at its best. Stall of foods, clothes, toys, utensils and interior decorative items at the cheapest rates makes it the perfect purchase as well as window shopping destination. The above places are definitely going to make your Mysore trip the best one you have had to date. But after a tiresome day of roaming the city, you would want to top it with a cherry with the best hotel stay near Mysore palace with top class amenities too. This is none other than Kings Kourt hotel.